Stampin' Cafe by Lana: Stampin Friends "No Rules" July Blog Hop - Coffee Break! 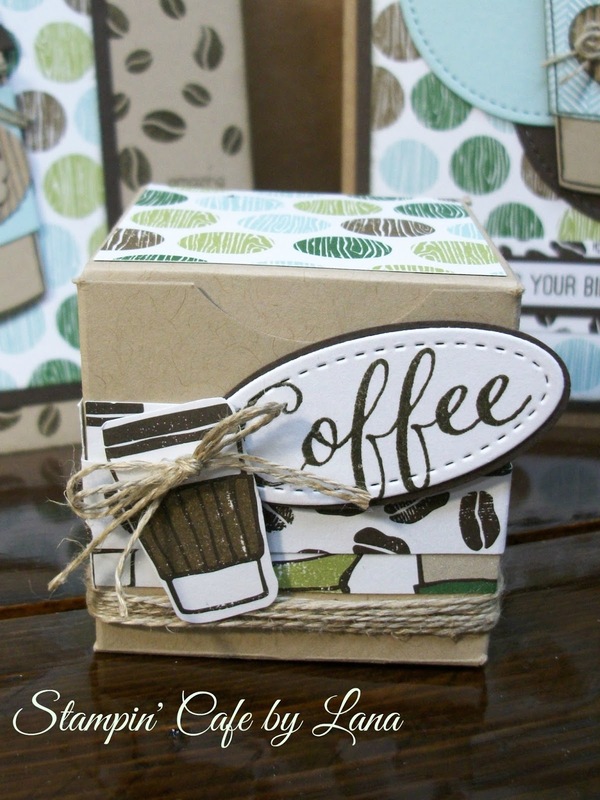 Stampin Friends "No Rules" July Blog Hop - Coffee Break! Grab a cup of coffee and come along with us for a coffee break! Here is the coffee cup birthday card I made. It is a standard 4-1/4 x 5-1/2 inch card, top folding. 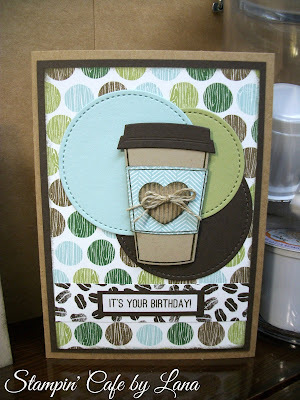 I used Crumb Cake cardstock for the card base, adding Early Espresso and a piece of DSP from the Coffee Break DSP pack. 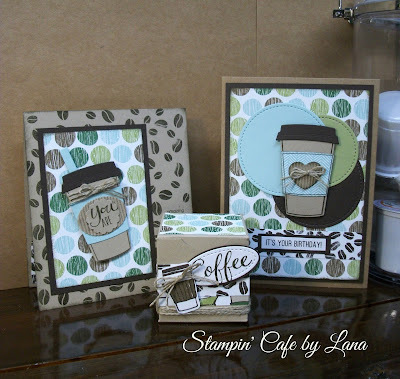 I then die cut some circles using Stampin' Up's Layering Stitched Framelits in Soft Sky, Pear Pizzaz and Early Espresso. I die cut my coffee cup in Crumb Cake, the lid in Early Espresso, and the wrap in Soft Sky. I added one of the heart embellishments from the coordinating Corrugated Elements from Stampin' Up, and a small bow tied with linen thread. I cut a 3/4 inch strip of the coffee bean DSP to go across the bottom behind my greeting, which was stamped using the Seriously Amazing stamp set from the August 2014 Paper Pumpkin Kit. 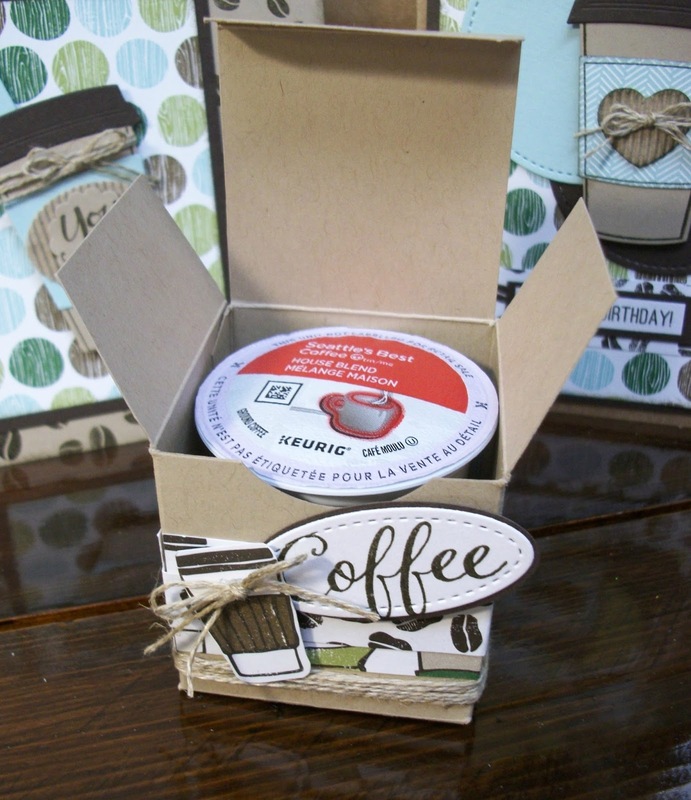 For my project, I made a simple 2-inch square, top opening box, that holds a Keurig K-Cup just perfectly! 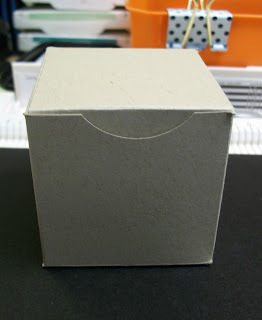 I fashioned the box after the small kraft treat box Stampin' Up used to carry. Directions for my version of the box are below. I used Crumb Cake cardstock for the box, added some DSP from the Coffee Break DSP, cut out one of the cups from the DSP, and added it on with a dimensional. I added a linen thread bow and stamped "coffee" from the Caffeiene Addict stamp set onto a small stitched shaped oval. You could use whatever stamp set you have. I wrapped some more linen thread around the bottom of the box. 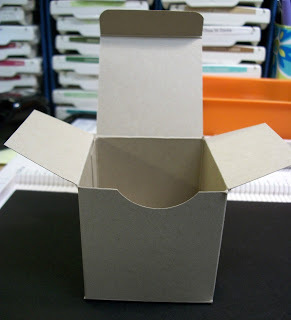 Below are photos with directions for making the box. Start with a piece of cardstock cut to 6 x 8-1/2 inches. On the 8 inch long side, score at 1/2 inch, 2-1/2 inches, 4-1/2 inches, and 6-1/2 inches. Turn, and on the 6 inch long side, score at 1-1/2 inches, 3-1/2 inches, and 5-1/2 inches. Fold on score lines and cut as shown below. 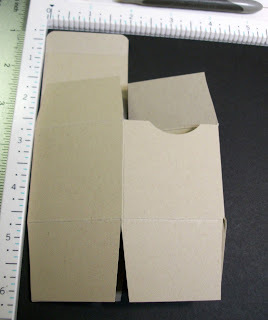 The small piece remaining on the lefthand side is the flap to attach the box together. 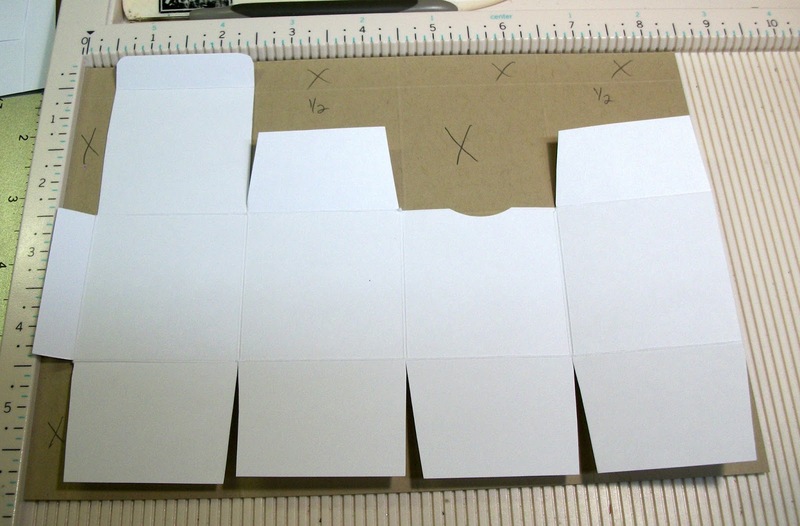 Fold the box together, attaching at the flap shown above. At this point, the box will fold flat until ready to use. Fold in the bottom flaps to form the bottom of the box and adhere. 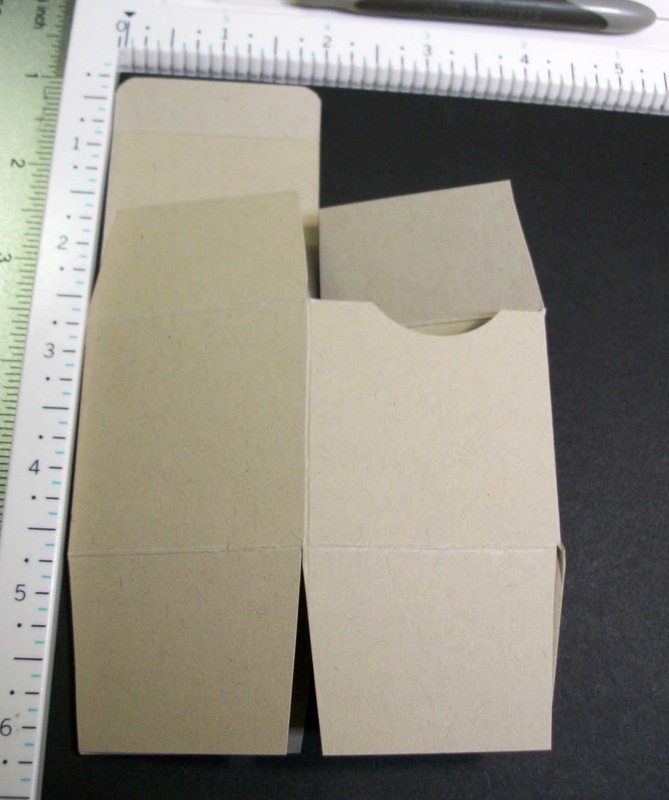 Use a corner rounder to round the top flap of the box closure. Use a small circle punch to punch out a partial circle on the front of the box to make it easier to remove the flap closure. Decorate as desired and insert your K-Cup! If you are interested in how I made the other card shown in the top photo, I will feature it in next week's blog. It is a gift card holder. I will also be using the same fold for a masculine gift card holder. Please follow along now with the other talented hoppers listed below. Just click each name and you will be taken to their blog. Happy hopping! I hope you are enjoying your "coffee break!" Beautiful projects Lana,I think I'm gonna try the box. Mine was a little different in shape, and I like yours too! Thanks so much for sharing it! I just adore your projects today Lana! TFS the directions on your cute little box too! Love the projects this was the first suite on my wish list before the catalog went live!!!! Thanks for sharing the directions on making the box!!! Great minds - I used the same suite of products. Love these! Your project is adorable, and I LOVE that you provided the instructions! Thanks very much for sharing your wonderful creation! You are so welcome! I'm glad you liked it! Wonderful project suite. I love your coffee card layout.